Continual Improvement requires much more than "right" techniques! 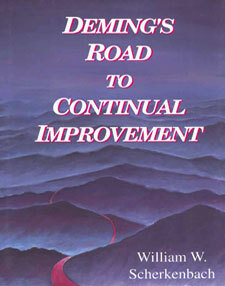 It is an entirely new way of thinking…a philosophy of Profound Knowledge…as defined by W. Edwards Deming. That philosophy is the inspiration and guide for this book. You will be challenged by ideas that are the proven foundation for increased quality, increased productivity, and improved competitive position. They are being used by large numbers of leading business people in many different cultures and in every type of business. Understanding Profound Knowledge involves a revolution in thought. Operationalizing Profound Knowledge requires an evolution of practice. Both of these requirements are addressed in this unique book. Based upon Scherkenbach's years of study under the tutelage of Dr. Deming, and his work at both Ford and General Motors, this book provides a clear review of concepts, but also goes a step further—it shows how these concepts can be put to work in your business. "Understanding Successful Experimentation" is the class I needed. After years of being mystified, I finally know how to use experimental designs!